These low carb chocolate cheesecake brownies taste as good as they look! 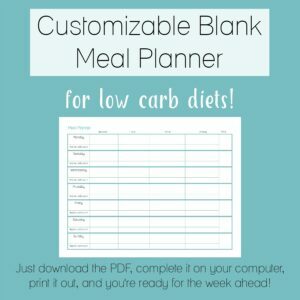 Sugar free, keto, LCHF, and gluten free recipe. 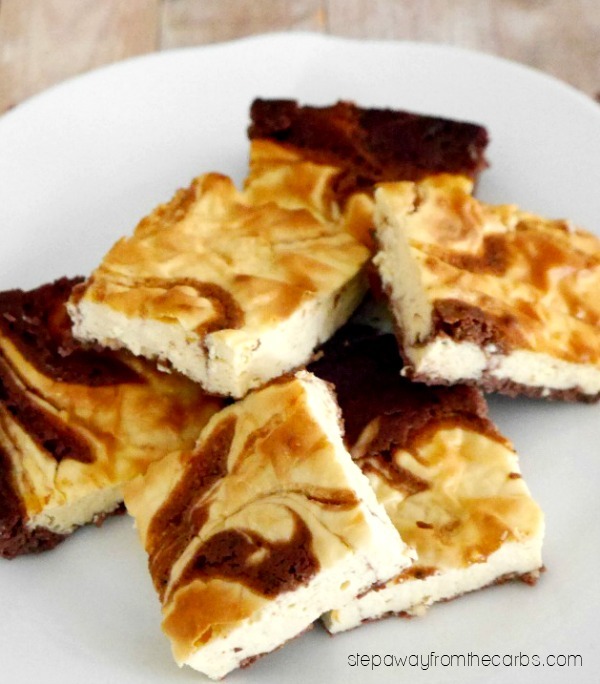 This recipe is one of fabulous treats found in my book: Low Carb Chocolate Recipes! The book is available in paperback, Ebook and Kindle formats, and features over 60 low carb, sugar free and gluten free recipes! Desserts, sweet treats, drinks, baked goods, frozen treats – and more! 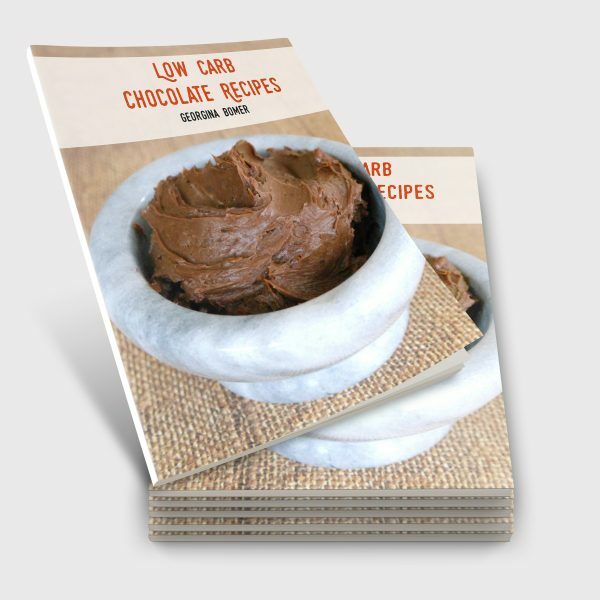 Get your copy of Low Carb Chocolate Recipes today! Cream together the butter and low carb sweetener in a stand mixer. I use xylitol but something like Swerve would work well too. Add almond flour, an egg, cocoa powder and water, and mix until smooth. 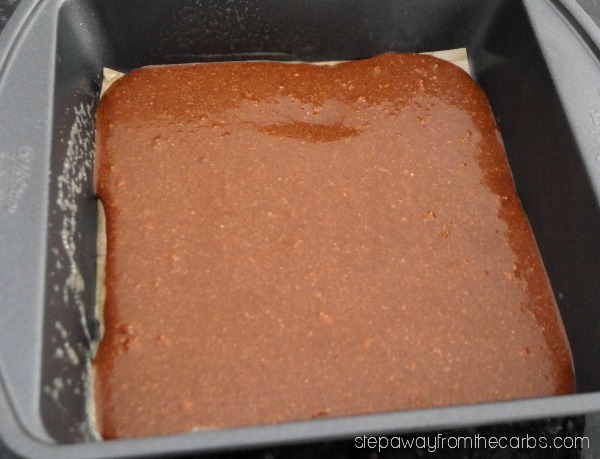 Pour into an 8×8″ square tin lined with parchment paper. Either clean out the stand mixer bowl, or use a hand mixer for the cheesecake layer. Actually I know people who have TWO bowls for their stand mixer – I think I’ll be adding another one to my wish list! Whisk together some cream cheese, granular sweetener, another egg and some vanilla extract. Pour the mixture on top of the chocolate brownie layer. Use a skewer, knife or toothpick to gently swirl the layers together. 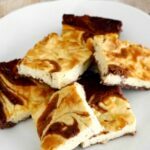 Bake in a preheated oven for around 25 minutes or until the cheesecake topping is firm. 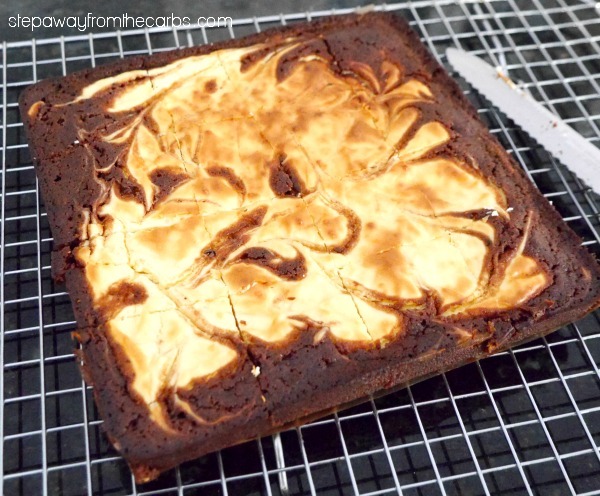 Transfer the brownies to a cooling rack and let cool, then cut into 16 squares. Enjoy this delicious low carb sweet snack! Preheat the oven to 350F. Line an 8x8” square baking tin with parchment paper. In a stand mixer, cream together the xylitol and butter. Add the remaining brownie ingredients and beat until thoroughly combined. Pour the mixture into the prepared tin. In a separate bowl, whisk together the cheesecake ingredients until smooth. 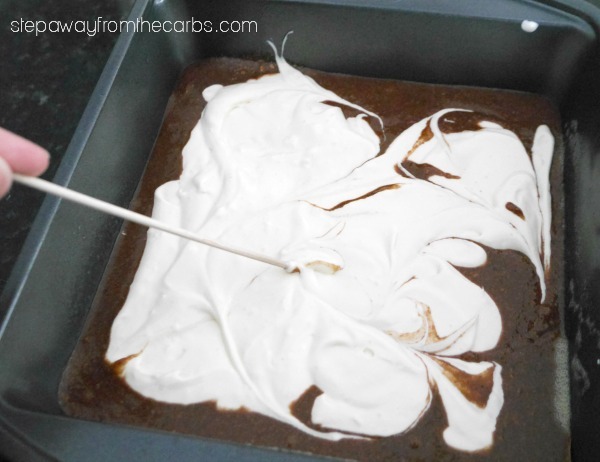 Pour the mixture on top of the brownie mixture, and gently swirl them together with a skewer. Bake for 25 minutes or until the cheesecake topping is firm. 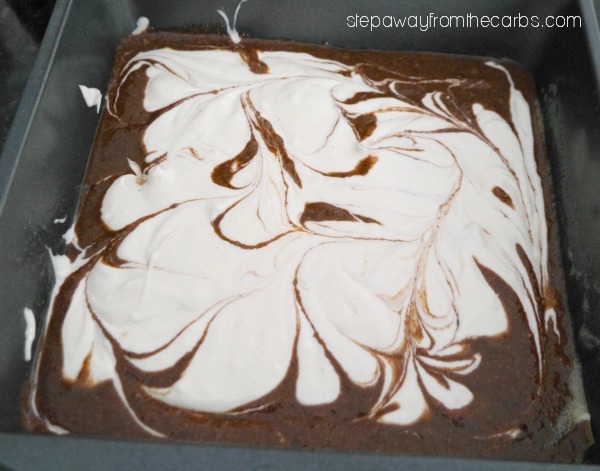 Let the brownies cool then turn out onto a cooling rack and cut into 16 squares. 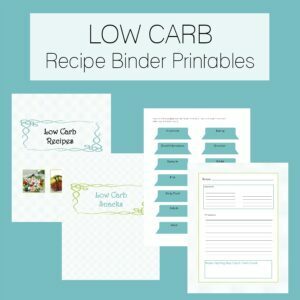 Don’t forget to get your copy of Low Carb Chocolate Recipes! One of my favourites too! You may like to know that they also freeze beautifully. what can I use instead of xylitol? I’ve only tried it with xylitol but granular Swerve might be a good alternative? These were wonderful thank you ! Yay! I’m so happy that you liked them!